Meet Annika: Our Youngest Zooite! 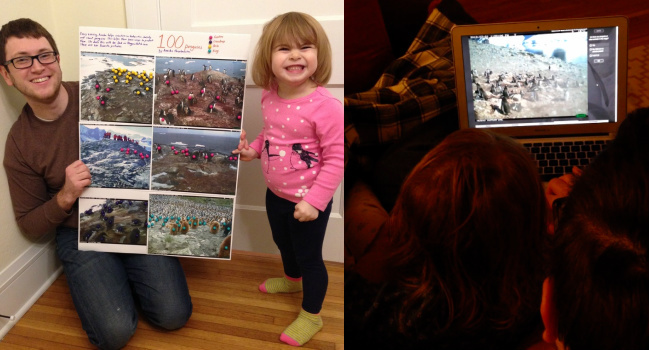 The [left] image is the project she did for her schools “100 Day” where they had to display 100 of something. She decided to do penguins, so we printed her favourite photos and she counted 100 by poking pins into the penguins. As you can tell, she is very proud! This site has brought her right to the action and has built an authentic interest. We salute you, Annika and Nick, and wish you much happy penguin-hunting to come. Join them today over at Penguin Watch! Next Next post: Zooniverse Global Challenge!